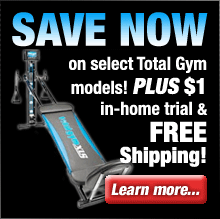 Free Shipping On All Treadmills From Horizon Fitness! The Horizon Fitness T100 treadmill is a very affordable treadmill with a variety of innovative features and benefits that make it perfect for fitness buffs on a tight budget. 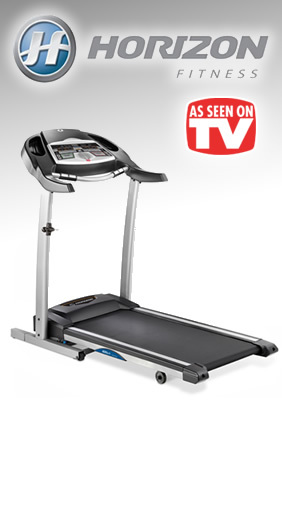 The T100 has been replaced by the NEW T101 treadmill, with a updated design and lots of new features. One of the top features of the Horizon Fitness T100 treadmill is Horizon’s exclusive AEROsoft cushioning system. This advanced cushioning technology ensures a low-impact running experience that’s easy on your knees and ankles. The T100 also features a roomy 18″x52″ running area which is suitable for runners of all sizes. The Horizon T100 treadmill also offers a handy console with five LED displays so important settings and stats are easily visible. In addition the T100 allows you to monitor your heart rate with the included hand grips. Spacious 18" x 52" running surface. AEROsoft cushioning system for a comfortable workout. Durable metal frame with easily foldable, space saving design. Console with 5 LED displays to keep you informed while working out. Speed range of 0 to 10 MPH. Variable incline range from 0 to 10%. 6 fitness programs ensure a challenge each time you work out. Monitor heart rate with the convenient hand grips. COOLfit fitness fan to keep you cool while working out. Heavy duty 1.75 CHP motor designed for long life and quiet operation. Supports user weight of up to 275 lbs. Lifetime warranty on frame, 7 years on motor, and 90 day warranty on parts. If you’re tight on space the Horizon Fitness T100 treadmill is the perfect solution – when you’re done with your workout simply fold it up to save space. The Horizon Fitness T100 treadmill is well-built and designed for long life. It’s constructed with an extremely durable metal frame that’s backed by Horizon’s comprehensive lifetime warranty. In addition it features a heavy-duty 1.75 CHP motor which is designed for not only a long, trouble-free life but also to operate quietly. The Horizon Fitness T100 treadmill is an exceptional value for those who seek a feature-rich treadmill that won’t put a dent in their budget. 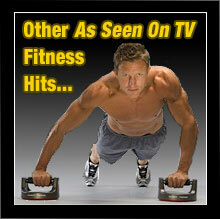 Horizon Fitness stands behind every treadmill that they manufacture and they completely guarantee your satisfaction. Simply purchase your machine (direct from Horizon Fitness) and give it a thorough workout for up to 30 days. If you’re not 100% satisfied with the results, simply contact their customer service department for a Return Merchandise Authorization number and return the machine (including any accessories) in its original condition and packaging to receive a full refund, less return shipping & handling. * The above guarantee is for purchases made through Horizon Fitness only. Be sure to check the current return policy of all retail partners presented on TVgyms.com for the most up-to-date information.